Section 5 is in the Gold Circle area on the ground level right in front of the stage. The tickets are good for all 4 days (and nights) of the festival, June 6 - 9, 2019. These are awesome seats and the event is 4 days/nights of fun! I renew my seats for the festival every year but this year I won't be using all of them so my 2 extra seats in Row 21 are available to you! If this is your first year attending, you will have a great time and the lineup always includes nearly all of the top artists in country music. I've had these seats for 10+ years so if you have questions about the event then just let me know and I'll be happy to help. Tickets will be mailed to you in early May within a day or two of when I receive them from the CMA. 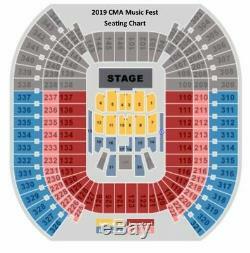 The item "GOLD CIRCLE CMA Music Festival Section 5 Row 21 Side-by-Side Up Front" is in sale since Sunday, April 7, 2019. This item is in the category "Tickets & Experiences\Concert Tickets". The seller is "b2224reigh" and is located in Elgin, Illinois. This item can be shipped to United States.